August 25th, 2016 marked the 100 year anniversary of the National Park Service in the United States. In celebration of this historic event, we continue the efforts of others to drawn attention to the importance soil plays in the vitality of these parks. By showcasing the beautiful soil colors of the parks, we can better understand and appreciate the soils surrounding us. 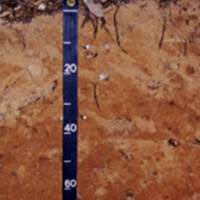 Soil color is not just an indicator of the makeup of the soil in a certain region, it can also help to indicate what the soil can be used for, whether it be for food production, maintaining, restoring or rebuilding ecosystems, conserving and promoting biodiversity, viability for water systems, classification of artifacts and more. Soil is the often overlooked “skin of the earth,” so let us “dig” deep and discover. Our journey begins with an interview with Soil Scientist, Susan B. Southard. As the National Park Service Liaison for United States Department of Agriculture, she has a tremendous amount of knowledge about soil. About Susan B. SouthardSusan Southard is a soil scientist with the Natural Resources Conservation Service in Davis, California. She has worked for nearly 40 years as a university, state and federal employee of the National Cooperative Soil Survey. In the last nine years she has been assisting the National Park Service in completing soil inventories of 250 NPS properties. She completed a BS degree with a concentration in soil science from the University of Rhode Island and post-graduate classwork from North Carolina State University and the University of California at Davis. What is Unique About the Soils of the National Parks? First off, we need to consider all properties under the jurisdiction of the National Park Service (NPS). Not all NPS properties have “National Park” status. There are 58 properties designated as National Parks of the 412 park properties, the rest are either battlefields, preserves, historic sites, scenic rivers, national monuments or many other designations. Of the 412 NPS properties, about 250 have soil surveys. The soil surveys were completed by soil scientists of the USDA’s Natural Resources Conservation Service (NRCS). Soil surveys are maps with very detailed attribute data that describe chemical and physical properties of all the soils identified in the park. Part of the soils data includes soil color that has been recorded scientifically using Munsell soil color notation as a uniform national standard. 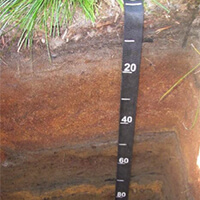 Soil colors are recorded starting at the surface and in every soil layer or horizon that lies below the surface. These unique assemblages of soils also support unique assemblages of vegetation and wildlife. The uniqueness of the soils lies in the fact national park properties preserve special environmental conditions and soil forming factors, that working together, form unique assemblages of soils that are very often only in those park lands. These unique assemblages of soils also support unique assemblages of vegetation and wildlife. Soils under NPS jurisdiction become protected from development and intensive use, preserving their existence and diversity. Soil color diversity of these soils includes the magnificently colored thermal soils of the Grand Prismatic Springs of Yellowstone National Park, the light-colored soils of the desert Southwest formed from sandstones and shales such as those at Arches and Bryce National Parks or the dominantly light colored soils derived from granite in Joshua Tree National Park. Light-colored carbonates in soils of desert regions influence the color of soils as well. While you're visiting Yellowstone National Park, be sure to set a few hours (or a day!) aside to spend time at Grand Prismatic Spring. Located within Yellowstone, Grand Prismatic Spring is the largest natural hot spring in the United States, and one of the largest three springs in the world. With 160 degree water temperatures and expanding over 300 feet in diameter, the spring is best known for marvelous colors that change form season to season. From bright oranges in the summer to deep winter greens, Grand Prismatic Spring is a sight you won't want to miss! With rugged rock formations and unique desert landscapes, Joshua Tree National Park in Southern Califronia is named after the famous twisted Joshua trees popping up across the desert. Stretching from the Colorado Desert to the Mojave Desert, you'll find plenty of hiking trails to keep your journey moving throughout unique rock formations. Arches National Park is true to its name. Comprised of over 2,000 natural stone arches, at the oldest exposed level, the rocks of these formations are believed to be 290 million years old. This level of strata is largely responsible for the appearance of the arches today and each layer tells a unique story of the time period it was formed. The soils have been influenced by the rock formations because of their highly varied chemical, physical, and morphological compositions and are constantly evolving throughout their formation. This is a park you are going to have to see to believe. What Do the Soil Colors Tell Us? The stories soil colors tell us vary with the ecosystems in which the soils formed. Some soils are white because the parent material they formed in was white. 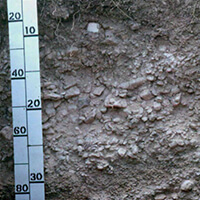 These soils would have inherited the white color from the parent material. For example, the white dunes and soils of White Sands National Monument are due to the gypsum in the soil. Or the local parent material may be red, white or purple shales and soils forming from them are multi-hued, such as in Dinosaur National Monument. True to its name, Dinosaur National Monument does not disappoint when it comes to fossils, or soils. With exposure from upwards of 1.2 billion years ago, there is no shortage of history to study during your visit. Many soils vary throughout the park, because of its extensive past, and range from very shallow, to very deep, and can be found in a wide array of textures and elements. If a glimpse into the Earth's history is what you're looking for, travel no further than to explore the soils and fossil structures at Dinosaur National Monument. A profile of Strych soil in map unit 38, Milok-Solirec-Strych complex, 10 to 65 percent slopes, very stony at Dinosaur National Monument. 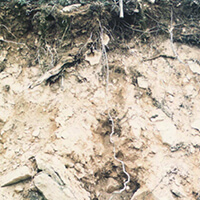 Some soils may be brown or black because the parent material was decaying organic material such as some wet organic soils in Acadia National Park while other soils may be brown or black because the parent material source are sediments that are brown or black, with very little organic matter in them. Soils of Redwood National Park are often very red because of intensive weathering in a maritime climate. Redwood National Park is made up of five units, so you can bet you'll find a variety of soil colors, textures, and compositions during your visit. With the Pacific Ocean to the west, Smith River up north, Six Rivers National Forest to the east, and private lush land tipping south, it's easy to see how rich soils of the area support wildlife and greenery alike. Afterall, there must be something in the spil to support those famous Giant Redwood Trees! Mineralogical transformations (i.e. weathering processes) in soil results in different soil colors because different minerals have different colors. 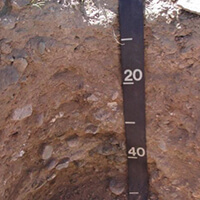 Soil scientists can measure at what depth wetness or a water table exists is in the soil because of soil color patterns of different mineral types that form in variable wet conditions. 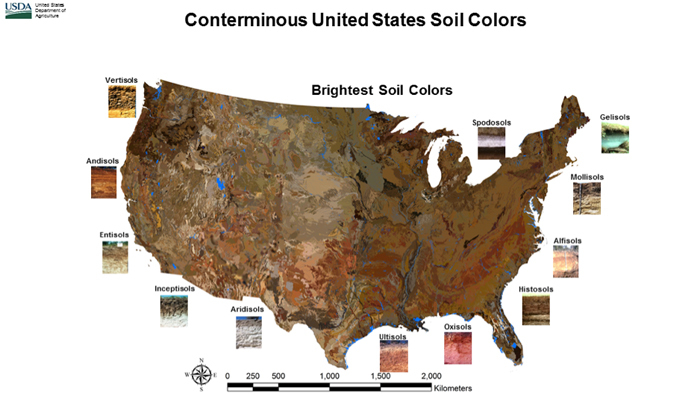 Landscape stability also dictates soil color by preserving soil colors formed from weathering of minerals in the soil horizons. A stable landscape allows soil weathering processes to act longer, developing different colors in the soil. Consequently by using color intensities we can judge land surface age, and make assumptions about landscape stability and past climates. Generally speaking, given a similar time frame, wet and warm climates create different soil colors than hot and dry climates. Lassen Volcanic National Park gives hikers and visitors a variety of natural formations to enjoy. From boiling hot springs to steaming sulphur vents within the Earth, you'll always have an active sight to see. Located in Northeastern California, Lassen Volcanic National Park is known to be the home of Lassen Peak, which is the largest plug dome volcano in the world. During your visit, pay mind to hardened volcanic lava making up soils of the ecosystem. With tall greens and snow-capped mountain tops, Lassen Volcanic National Park is sure to give you wonderful pictures to enjoy for years to come. Buried horizons in soils usually have darkened, buried A horizons (due to greater organic carbon that was in the surface horizon) which can tell us if there are risks of flooding, landslides, erosion, tsunamis, erosion or earthquakes, depending on where you are in the country. 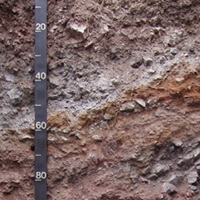 Many soils develop distinctly colored subhorizons (soils below the surface) because of leaching. This is a prominent process in sandy wet soils such as those in Acadia National Park. Soils formed in volcanic tephra such as those at Crater Lake, Mount Rainier, Hawaii Volcanoes National Park and North Cascades National Parks may have highly contrasting colored horizons due to layering of volcanic ash and also due to leaching. The soil colors of Mount Rainier National Park in the state of Washington are guaranteed to provide beautiful sites from any area within the park. The soil formation processes give this park unique and beautiful characteristics. Here you'll find the 14,410 ft. high peak of Mount Rainier, as well as a 6,400 ft. tall point known as Sunrise- the highest point within the park accessible by car. With rolling meadows and rocky soils, you'll admire the raw beauty of Mount Rainier National Park! 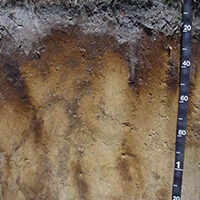 This soil from Mount Rainier National Park has many layers of tephra from volcanic eruptions in the Cascade Mountains. 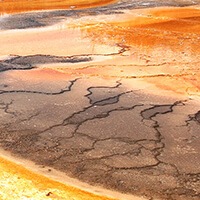 The colors are clues to the possible source of tephra. (NRCS file photo by Susan Southard). How is the Approach to Soil Science and Soil Management Changing in National Parks? There is growing awareness of soils in the NPS. The National Park Service has made a great effort to complete soil inventories of their lands and have trained staff to use the information. 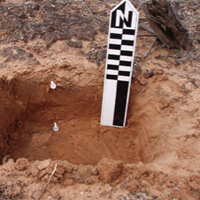 There are some NPS restoration ecologists using soils data in their work, with their efforts mostly focused on infrastructure maintenance, such as road revegetation work. There are a few park visitor center soil displays at Pinnacles National Monument in California, Big Bend National Park in Texas and Walnut Canyon National Monument in Arizona. There may be a few others too, but soils information has never been the highlight of any visitor center display, nor interpretive program, but the interest is growing. With a history spanning over 500 million years, Big Bend National Park has no shortage of stories to tell. The park has gone from being completely submerged under an ocean trough, to a hot mine of volcanoes, to eventually, the arid, mountainous climate we experience today. Described as a 'geologist's paradise,' because of the sparse vegetation and staggering amounts of visible rock throughout the area, scientists can dig deep into the past! The park does not suffer from light pollution because of the sparse human population in the region, enabling researchers and tourists to view approximately 2000 stars on a clear night! This is the Chilicotal soil that is gravelly and high in calcium carbonates. It supports mostly grama grasses and desert brush. The effects of high-shrink swell soils on park buildings and roads, and Visitor Centers placed in floodplains and areas of unstable soils should be explored. The effects of soil erosion after catastrophic wildfires due to historic fire suppression is evident in some parks. These are all land management issues that should involve considering the soils first. Overall, in my view, the top concern in soil management in the NPS system would be the effects of climate change – loss of permafrost, sea level rise and effects of catastrophic wildfires. There is a dramatic loss of permafrost soils in National Parks and Preserves in Alaska. While we probably cannot do anything now to stop the loss, there are consequences to human health and safety, and loss of infrastructure. In all coastal parks from Acadia National Park, Cape Cod National Seashore, Gateway National Recreation Area, Assateague Island National Seashore, Cape Hatteras National Seashore to Canaveral National Seashore and Everglades National Park, the coastal tidal marsh soils and dunes play a critical role in protecting these areas (and populations) from shoreline changes and flooding due to sea level rise. Accelerated soil erosion after wildfires in parks like Santa Monica Mountains National Recreation Area, Sequoia-Kings Canyon National Park, Yosemite National Park, and Crater Lake National Park require progressive solutions to stabilize. One of the most marveled parks, Crater Lake, is an oxymoron in and of itself. The result of a combination of actual fire and ice, this collapsed volcano is guaranteed to make your jaw drop. Occupying an area of historic volcanic and glacial activity, the once magnificent Mount Mazama volcano, collapsing over 7,700 years ago. Today, the lake is about six miles wide and almost 2,000 feet deep, the deepest in the country. Because of the glacial history, some of the oldest soils in the park are made up of glacial till, most commonly found at higher elevations. Be sure to explore the remnants from the eruptions that helped to form this park. The Collier soils of Crater Lake National Park are typical of ashy sandy soils formed from a single volcanic source so colors are not as varied as those observed in Mount Rainier National Park. Soils offer the largest terrestrial storage of carbon which is implicated in global warming. By managing park soils for carbon sequestration by minimizing surface disturbances, NPS can contribute to the mitigation of carbon loss to the atmosphere. To me this is an important political point about the ecosystem services soils provide. Known as one of the most beautiful places in America, Sleeping Bear Dunes National Lakeshore covers 111 square miles of sand dunes along Lake Michigan. The park is at your fingertips- choose your route and travel through clear inland lakes, lush green forests, and nature's most beautiful plants and animals. With the park's varied soils, enjoy blooming wildflowers and other wildlife that call this park home. The Kalkaska soil is mapped extensively in and around Sleeping Bear Dunes National Lakeshore. The colorful profile displays biogeochemical processes such as illuviation, eluviation, enrichment, decomposition, and humification. This gif image aggregates all the soil color observations soil scientists have made over decades of field work. The gif displays soil color in slices at uniform depths. 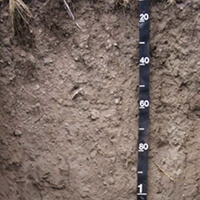 The gif was prepared by USDA-NRCS soil scientists at the National Soil Survey Center. When all the Munsell colors are displayed in a national map of soil color we can see interesting patterns. A glimpse of the nationwide 0 to 5cm slice has darkest colors due to near surface organic matter content. The overall map gets brighter as the image slices to deeper soil depth. Noticeable is the bright red swath associated with the Piedmont region of the southeastern United States and the Red Prairies of Texas and Oklahoma and the Arkansas valleys and ridges and Ouachita Mountains, where high iron oxide content hematite is in near surface horizons. 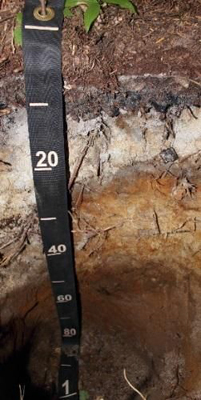 Florida soil colors become grey with depth slices, not redder, due to near surface sandy horizons that have high quartz content that have been stripped of color through the process of podzolization. Areas south of Lake Okeechobee in Florida remain dark in the animated slices due to thick, black humified organic soils of the Everglades National Park and Big Cypress National Preserve. The northern tip of Maine surrounding the end of the Appalachian National Scenic Trail shows the definitive slice sequence of Spodosols with surfaces of dark brown color, then grey of the bleached sand grains below the surface then brightening of the subsoil to reddish brown created by the translocation of humus-metal complexes in the subsoil. Just west of the Appalachian Mountains, stretching from Maine to South Carolina is a swath of yellowish brown colors observed in the 25cm slice. This is goethite in the upper subsoil. The dark black Mollisols that formed in loess southwest of Lake Michigan, surrounding the Lincoln Home, the Ulysses S Grant, and Harry S. Truman National Historic Sites, remain dark colored through sequential slices in the gif. The thick brown alluvial soils of the Mississippi River valley to the southeast are also evident. Stretching to the northwest from lower Lake Michigan is a swath of dark colored soils formed in till and loess. The grey and white “Salt Flat” soils west of the Great Salt Lake and southwest of Golden Spike National Historic Site also remain light colored through all the depth slices. The light colored surfaces to 15 cm in the Joshua Tree National Park region are also evident in southern California, north of the Salton Sea. Explore around the map for places you know about and think about why the soils are colored the way they are! Stay tuned for more interviews in the coming weeks with soil experts as we continue to celebrate the National Parks 100th Anniversary.